In a bid to deliver better software experience on devices powered by 64-bit processors in the upcoming ­years, Google aims to shift towards a 64-bit app ecosystem. The company has now shed more light on the transition and has announced that developers will have to submit a 64-bit version of their Android apps starting August this year. This move will eventually culminate in a universal implementation of the 64-bit app policy that will be enforced in 2021, after which, Google will no longer host 32-bit apps on the Play Store accessed on a device based on 64-bit hardware. Google announced the move towards 64-bit apps in 2017, claiming that apps with 64-bit code offer significantly better performance. However, the search giant did not provide any details regarding the exceptions to the new rule or when the Play Store will cease to serve 32-bit apps. Google has now revealed that starting August 1 this year, developers must submit 64-bit versions of all new apps and app updates, alongside the old 32-bit versions prior to their publishing from the Play Store. But there will be a few exceptions to this rule. 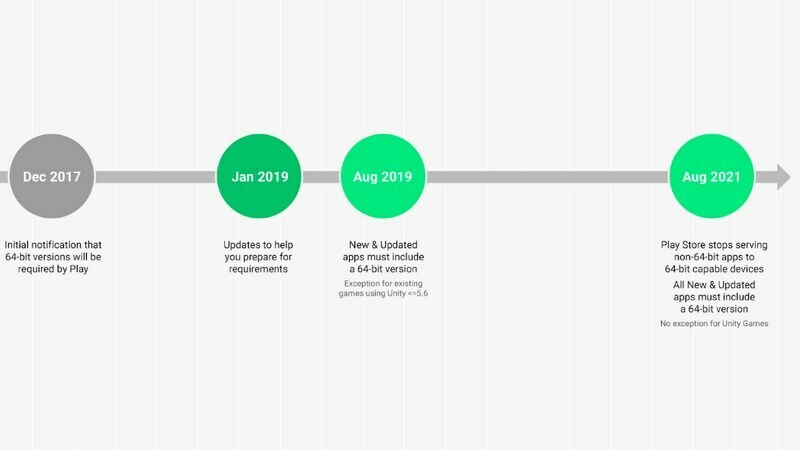 Google Play will keep pushing 32-bit updates for games built on the Unity 5.6 development platform or an older version. However, this will continue only until August 1, 2021. Additionally, APKs and app bundles designed for the Wear OS and Android TV platform which don't have support for the 64-bit code will be exempt from the rule. Lastly, all apps and package kits for Google's mobile OS that are not targeted at devices running Android Pie or a later version will also be excluded from the 64-bit-only requirement. However, it doesn't mean that Google Play will altogether shun 32-bit apps. Google Play will only stop showing 32-bit apps on devices whose processor supports 64-bit architecture. However, if developers have submitted a 64-bit version of the particular app, it will be listed on the Play Store when it is accessed on a 64-bit supported device. Also, Google Play will continue to serve 32-bit apps as long as they are being used on hardware based on the 32-bit architecture.